If a rotary can spring up almost overnight in West Lynn, imagine the other surprises waiting to be sprung on Lynn residents. Is it beyond the realm of imagination to wake up one morning and see a tramway climbing its way from downtown to High Rock Tower? 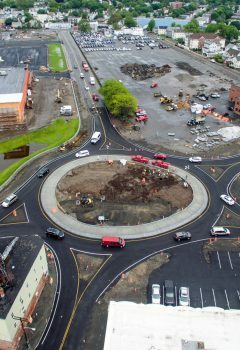 Driving down Federal Street and running into a roundabout is almost as surprising as the prospect of driving down the Lynnway and finding it stripped of billboards or finding traffic lights at the corner of Eastern Avenue and Western Avenue. Several questions linger in the wake of the new rotary’s debut. How long will it take some unaware or inebriated driver to plow across the rotary instead of around it? When will a statue or piece of public art rise in the rotary’s center? The good news is that a Lynn intersection that was once an eyesore is rapidly turning into a busy commercial sector. It’s hard to remember that Federal Street was closed to traffic for decades, barring Lynn residents and other drivers from a convenient straightaway linking Boston Street and Western Avenue. Lingering security concerns dating back to the Cold War kept the road unning by General Electric’s long-closed West Lynn plant off limits to traffic. Cars drive around the new rotary in West Lynn. GE’s unsuccessful “factory of the future” experiment on Western Avenue left an unused building on the corner of Federal and Western Avenue for years until city officials and Swampscott entrepreneur Charles Patsios worked with GE executives to make change happen on Federal Street.